Rancho Los Cerritos’ February Bird Walk is this Thursday, February 14th, from 8-9:30 a.m. (weather-permitting). Mating season is coming, and we already see pairs of birds spending time together. Bird walkers also might see migrant birds steal our fruit, fortifying themselves for their northward trek. 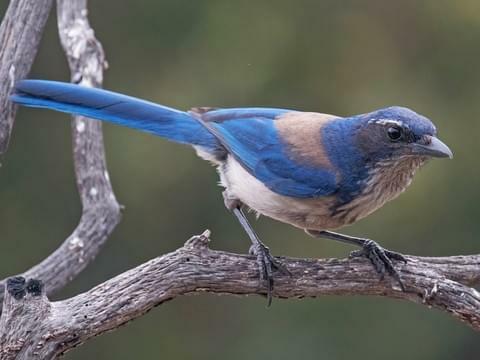 Another bird visitors might see is the California Scrub Jay. These little bluebirds often nest near the picnic area. They will build a cup nest of twigs in dense shrubs or trees, where they can keep an eye out for predators, calling loudly if intruders appear. Led by Naturalist Randy Harwood every second Thursday of the month, these bird walks highlight both seasonal migrants and native birds as visitors stroll through the gardens, listen to bird calls and songs, and observe nesting habits. Bird Walk is always free and open to all. Simply meet in RLC’s lower parking lot at 8 a.m., wear comfortable shoes, and bring a hat. Don’t forget your binoculars, or we have some to lend thanks to the generosity of Vortex Optics. In the event of rain, this event will be canceled.